River Haven Luxury Log Cabins are first-class cabins in the Murchison area of New Zealand’s South Island. Scott and Leya Murray own and run these superb cabins which are excellent in their own right for anyone wanting to spend some time exploring the area. What makes River Haven special for a fisherman is that Scott (known as The Trout) is one of New Zealand’s very best guides. He also works with other excellent guides who will make sure that you get the very best out of your fishing. There are two rivers within walking distance of your cabin and you can simply walk outside and have a cast. There are 20 rivers within one hour’s drive and another 20 accessible by helicopter which can pick you up at your front door. 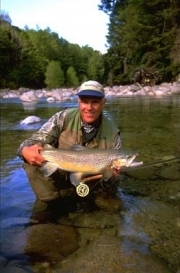 Scott led one of New Zealand’s teams of fishing guides for over 10 years. With over 40 years of fishing behind him, and 18 of those as a guide for one of New Zealand’s most respected lodges, his experience and knowledge are beyond measure. River Haven consists of three individual log cabins set in four acres of garden. Each cabin is for two people and is fully self-contained. Ideal for the discerning, independent traveller, it is situated next door to Kahurangi National Park which has activities to appeal to everyone. These modern cabins have air-conditioning, heating, double-glazed windows, flat-screen TV and even a laptop with high-speed internet. The bathrooms have all modern conveniences such as heated towel rails and de-misters in the over-sized bath mirrors. There is a large veranda – the ideal place for hanging waders, wet jackets, and a boot rack to dry your shoes. Excellent guides and some of New Zealand’s finest fishing on the doorstep. Land packages are from £1,550 for a 4-night stay.